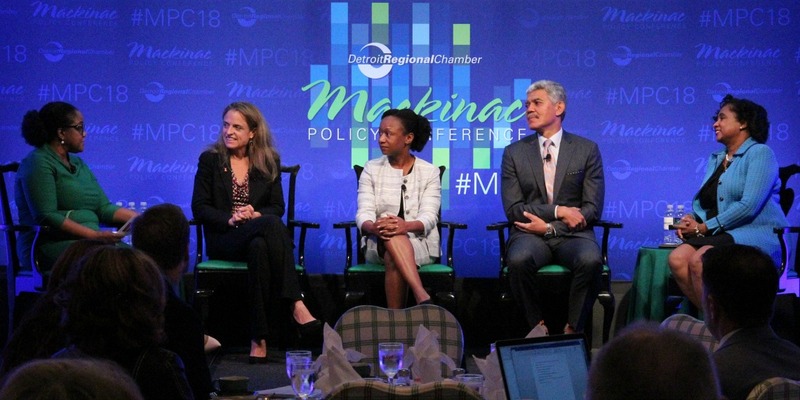 At the Mackinac Policy Conference on May 31, Wayne State University President M. Roy Wilson pledged $1 million — along with the university’s extensive research expertise — to radically improve health outcomes in Detroit. Wilson also floated the idea of collaborating with hospitals and other universities to create a school of public health in Detroit, further underscoring Wayne State’s commitment to community health. David Hefner, WSU vice president for health affairs, opened the presentation, pointing out that despite the fact that it spends the most money on health care, the United States is ranked 42nd in the world in life expectancy. That problem is even more pronounced in Detroit, where certain ZIP codes see a 13-year difference in life expectancy. The long-term initiative will begin focusing on cardiovascular disease because it is by far the leading cause of death in the United States and in Detroit, and its interventions can be measured over relatively short periods of time. During a panel discussion on how to bring about drastic changes, Jessica Donze Black, national vice president of community health for the American Heart Association, suggested that aspiration is key to affecting population health. The panelists agreed this will take a communitywide approach. Given all of the players needed to make radical change a reality, a Leadership Town Hall will be held on Wednesday, Aug. 1, from 3 to 5 p.m. at Wayne State’s Integrative Biosciences Center (6135 Woodward Avenue, Detroit) to engage additional community entities in the initiative. Kimberlydawn Wisdom, senior vice president of community health and equity and chief wellness and diversity officer at Henry Ford Health System, says the entire continuum of care needs attention. The $1 million committed by Wilson will be dedicated to “plan the plan” over the next year, which will involve receiving input from throughout the community on how to address the issue of community health. Wilson also committed to challenge every school, college and institute at Wayne State to examine how they can utilize their unique approaches to minimize health disparities. If the initiative proves successful, the new approach could be replicated and implemented in urban communities throughout the country. The group plans to track its progress and report back at the Mackinac Policy Conference each year for the next 20 years.